Woohoo! There is a HOT Claussen Coupon available. 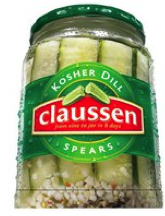 The coupon is for $2 off any jar of Claussen Pickles. You must “like” Claussen at facebook in order to print the coupon. The coupon is a bricks coupon.